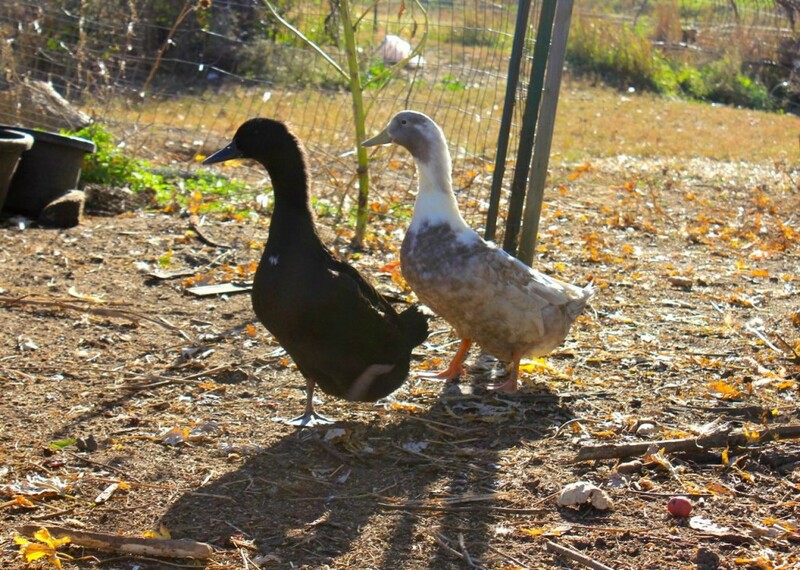 I have some very exciting news: we have broken our Duck Fast here at Old Depot Farm, after many years of my stout refusal to replenish our flock of ducks. 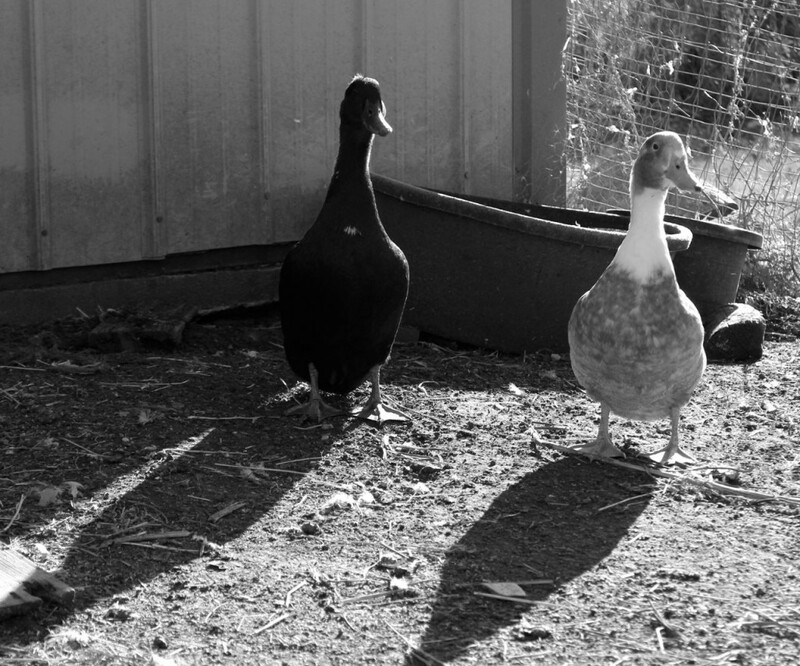 It’s kind of a long story, but I’ll give you the skinny on it (school starts in our kitchen in precisely 30 minutes, with a full day to follow) just because I love you Gentle Readers and I’ve got some sweet photos of our new ducks to share. First. We used to keep ducks, a beautiful flock of them (one precious flock after another, actually) which spent most of their time fussing and swimming and bathing and bobbing fluffy-bottoms-up for tidbits in the murky water of our little farm pond. 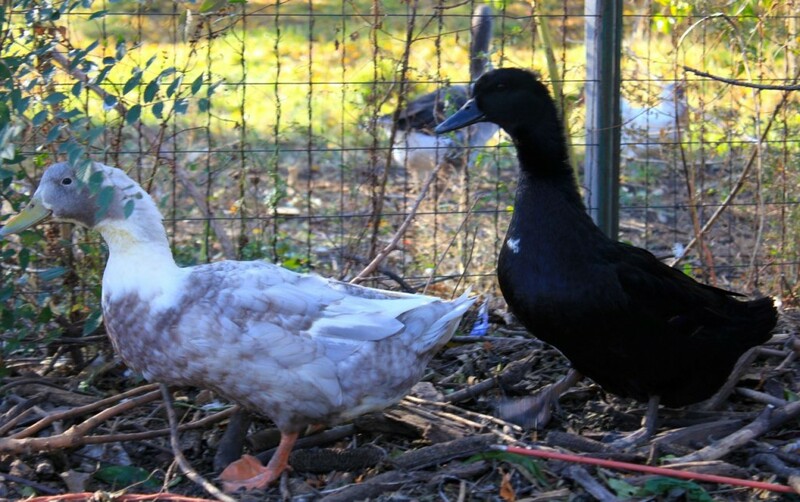 This, however, is what would happen, every stinkin’ time: the ducks, when firmly established on the pond, would stubbornly refuse to get off the pond at night and waddle up to the duck house for safety. We tried more strategies than I can name, to coax them off the pond at night and keep them safe. Here’s one story that I wrote about this dilemma. Even the pond itself cooperated some years, by shrinking up to a mere puddle that we could just wade into at bedtime, to herd them out. But other years, when water was plentiful, we could not get the ducks off the pond at night, and so the dreaded varmints in our area would find them and pick them off, one by one. Ducks will eventually swim to the bank for a sleep during the night. It is a heartbreaking thing, Gentle Reader, to wake in the dead of night to hear a duck squawking, from the direction of the pond, and to know that there’s really nothing you can do about it at that moment. 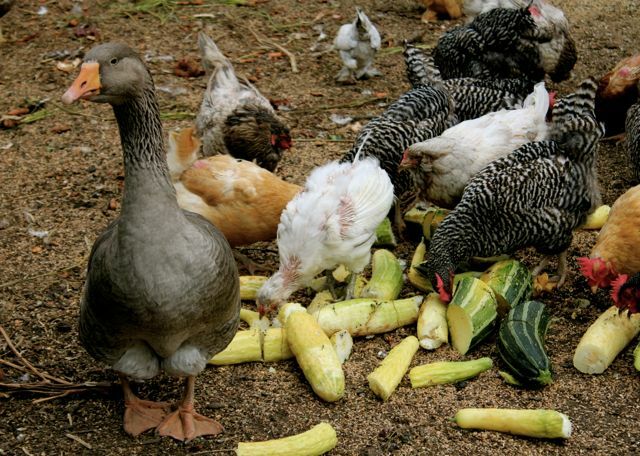 Except feel very, very sad for the duck that is now dinner for an ungrateful family of foxes. Ducks! Announcing new arrivals at our place. We had female ducks who would build nests around our place, usually nicely hidden in the long grass, and fill them with beautiful greenish-grayish eggs, only to suddenly disappear one night (with their eggs). One broody duck built a nest right up against the house and filled it with eggs, and I applauded her bravery and pluck and smarts in building it in such a safe place–after all, what critter would come right up to the house to take her? But then one early morning, as she waddled down to the pond for her early morning constitutional, something was waiting for her and she was gone, leaving her brooded eggs to chill. To make matters worse, during the summer of the Dreaded Varmint, our sweet goose Lucy lost her beloved are-you-two-twins? daughter, Blossom. Something just hauled her off her nest (it was under the back porch, too!) and away, and she was certainly an armful! That very day, Lucy moved in with the chickens and has been staying there ever since. Smart goose! As much as she surely misses the deep cool waters of the pond, she contents herself with sponge-baths in the chicken yard. And an occasional shower, from the hose. She’s smart and discerning, that goose. There are perks in living in close quarters with the chickens, after all. We all could learn a lot from her sacrifice. Although she would love more than anything to be in the pond, she knows that that particular self-indulgence could lead to death. So she resists the temptation. Hmm. How many parallels could I draw in this case? Several—except that we do, after all, start school in only 10 minutes, so I’ll have to resist this particular rabbit trail of thought.
. . . still resisting . . .lalalalalaaa . . . . The cumulative effect of all these sad events took its toll on my heart, Gentle Reader, and I (uncharacteristically) swore off ducks. “No–more–ducks!” I proclaimed, adding in a shrill, tired voice “At least not until we figure out how to build an island in the pond where they will be safe!” And we didn’t figure that out, though we put our collective imaginations to work for quite some time. We still haven’t figured it out. So we don’t have ducks. Or we didn’t. 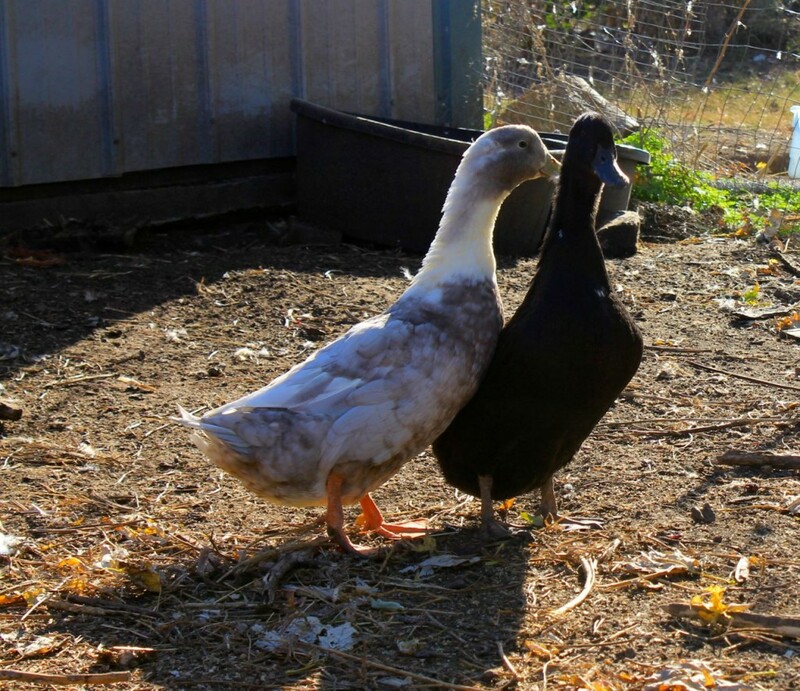 Until a friend asked me if I’d like a couple from her place–a duck and a drake. She had too many ducks and it was either butcher them, which she was loathe to do, or give them away. “No problem if a critter gets them,” she said, being familiar with our duck fast here, and just why it was in place. Then I had a thought. (Feel the ground shake, Dad?) 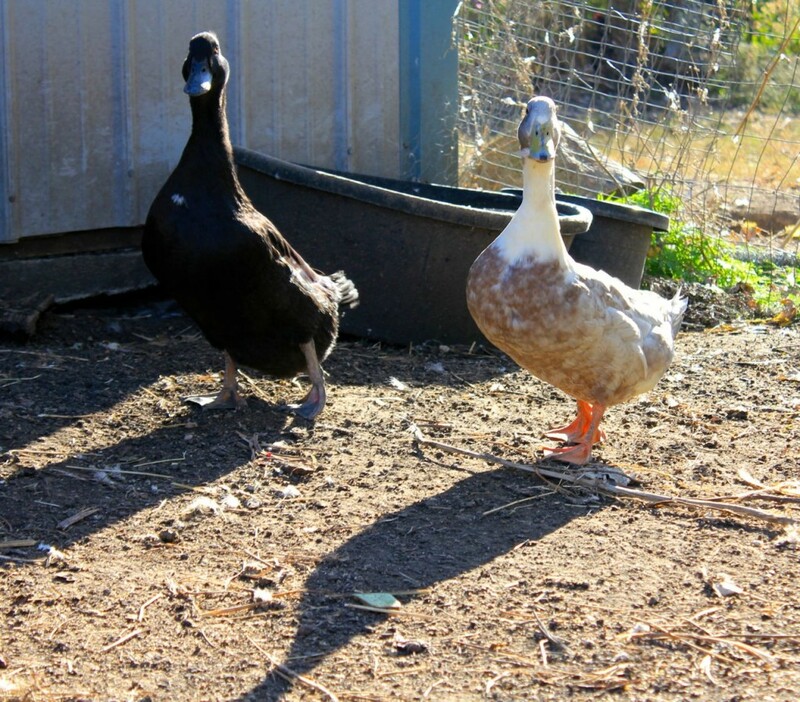 Maybe if I took the ducks, and provided a pool in the chicken yard, they’d pal around (waterfowl are notoriously clannish) with Lucy and not even go down to the pond. 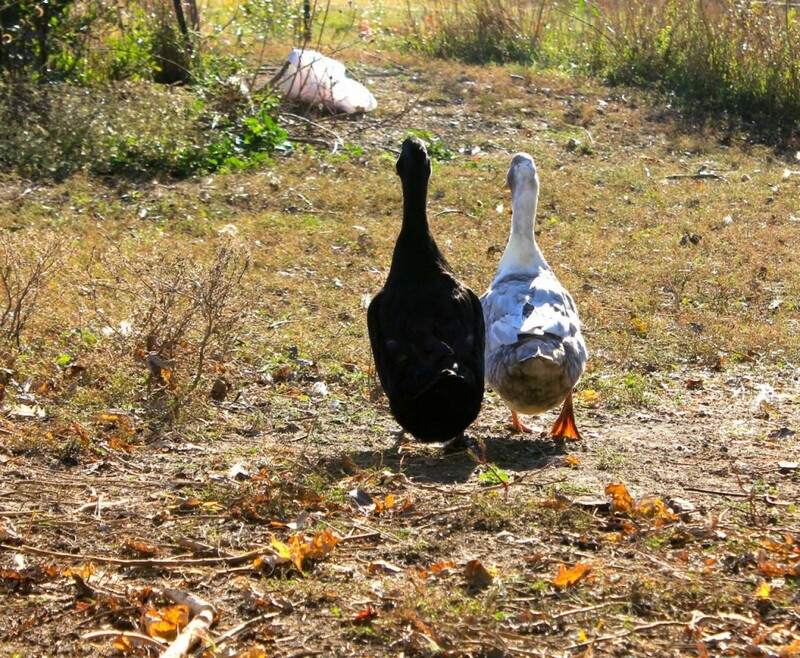 It is a far walk, for a duck, to the pond. And Lucy does stay away from it, mostly. So I broke my duck fast. I took the ducks. They are adorable. I love them. My life will never be the same. Little Mack and I dug a pit in the chicken yard the next day, and installed an old wading pool that we had on hand (first filling a couple of holes with Great Stuff–and hey, it worked!). It was hard work. Bryan helped, too, when our digging muscles got weary. Calpurnia and Rufert were quite shy the first couple of days, spending the entire time hiding in the back of the chicken yard, amidst the shrubbery. But then they apparently started to feel safe, because they emerged from the bushes and began to eat and waddle about, and act like ducks and pal around with Lucy, and–hooray!--bathe in the little muddy pool that we installed. New success on the duck front, (at least so far!) and a bad cycle of keeping-ducks-failure has hopefully been stopped in its tracks. Here they are. You’re going to love them, too, Gentle Reader. How could you not? I just love that little puff on Calpurnia’s head, and Rufert’s bright orange feet. Oh my. My thirty minutes is up! Time for school. Have a great day, Gentle Reader, and thank you so much for stopping by. I am glad you were able to get some more ducks. Plus finding a way for them to be safe and still swim. This might be a silly question but, why wouldn’t you have left the wading pool sitting up on the earth, and just built a ramp up for the ducks? That way you’d have been able to periodically drain it and refill it easily. Also, the ducks wouldn’t be doing that ‘nibbling earth and cleaning their bills in water’ thing that they love to do so much which will put quite a bit of earth in the water in no time. Rita. . . er. . . um. . . I guess that would have been a prudent option. This particular wading pool has steep vertical sides (the kind with a slide) and I wasn’t sure the ducks would be able to scramble up into it easily. We may regret sinking it into the earth, although little Mack assured me that we’d be able to siphon it when we needed to. We’ll see . . .! In an earlier version of my life, I too lost way too many ducks to predators. I hereby pledge to support you in your duck venture by promising to buy 1 doz duck eggs per week, and, when the time is right, two reasonably fat duck carcases (butchered and plucked of course) along about this time of year. You’re at the top of the list, Gene! Of course if the duck population expands out here, so will the need for a bigger chicken/duck/goose coop . . . .!! Congrats on your new ducks! My mom used to buy her little sister ducks at Easter, but she would always have to release them. My first pet was a chicken that my mom bought from a farm supply store. He grew into a rooster, chased the mailman, and made friends with our neighbor’s dog. It really would make for a splendid children’s book! He was a very loyal rooster. Sadly, our yard was unfenced and my parents gave him to some farmers at church who said all he did was eat himself to death because he was depressed. And as a result became their dinner . . . This was hard to stomach at four years old! Awww, that poor rooster! Chickens do need companionship, Nathana, I’ve found that to be true, as well. Oh for the love of ducks! One night last week four youngsters, the ones that survived the dog attack, didn’t come up from the pond with the other 15 ducks. I don’t know how they missed the mass exodus. I couldn’t get them out. I tried after dark thinking maybe they’d realize coming with me was better than staying out. At the same time I was out there, the little bear was eating apples under a tree 150′ away, though I didn’t know that until I looked at game camera pictures later on. Anyway. They spent a very cold night outside. I kept them all locked in the pen for a day afterward. They’ve come up every night since but I’m sure there’s another night outdoors coming. The night a skunk chased the ducks out of our duck house, there was no getting them back in, Robin—even after we shot the skunk! “Oh Little Mac, time to go clean the duck pond”……………..”ah must I” , “y yes young man, it is school homework on how not to duck our responsibilities, and you know how you like those duck egg omlets I make for breakfast before school….and watch where you step, wear your boots and take them off before you track through my new kitchen” Memories of life on the farm that he will keep forever….I know I have. Aww, I love hearing about your memories, Chef. The scenario you described sure sounds familiar . . .
Aww, so glad they`re getting along well. I was hoping you`d post lots of pictures of them. I love how they flock together, and flip the water off their backs. Ducks are my favorite; I could watch them for hours. My favorite too, Sarah! 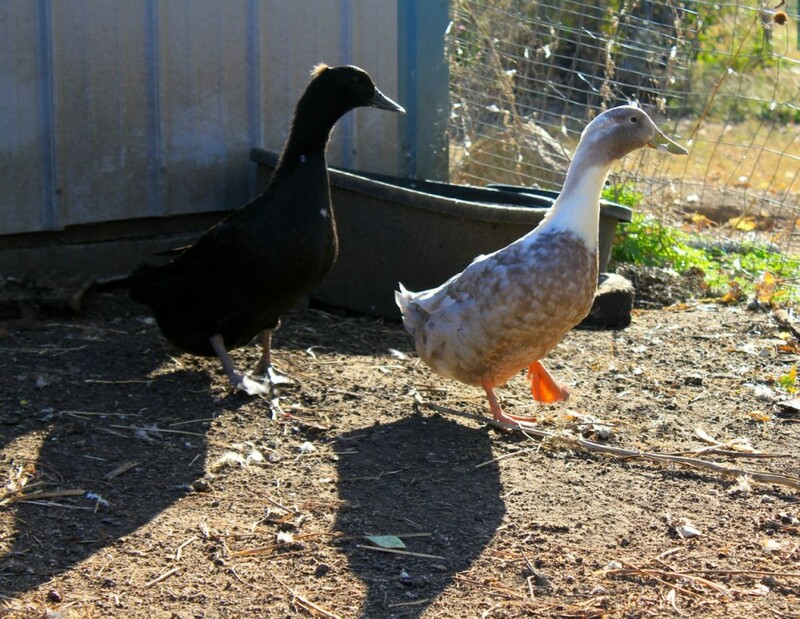 So happy that I have some ducks again! I love ducks. I can see how hard it was for you to lose them. But I’m so glad you’ve got the ducks back. Such interesting creatures.